Google has released Android P Developer Preview for four of its latest smartphones, as expected. We will get more details about the changes at Google I/O in May, but for now, the latest version includes an updated SDK and is available for testing on the official Android Emulator and the Pixel, Pixel XL, Pixel 2 and Pixel 2 XL smartphones. These are the only smartphones for which the preview is available. And yeah, it’s called only Android P for now. As expected, Android P brings along a lot of new tweaks and changes that take into account recent changes in smartphone design, thereby making it more user-friendly on smartphones and tablets. Let’s take a look at some of the standout features of Android P.
The one new Android P ‘feature’ that will probably receive the most attention is the built-in support for the iPhone X like notch for the front cameras. Google officially calls it the ‘Display Cutout Support’, as it looks to tackle UI challenges now that many Android OEMs are copying the iPhone X (and many more to come). 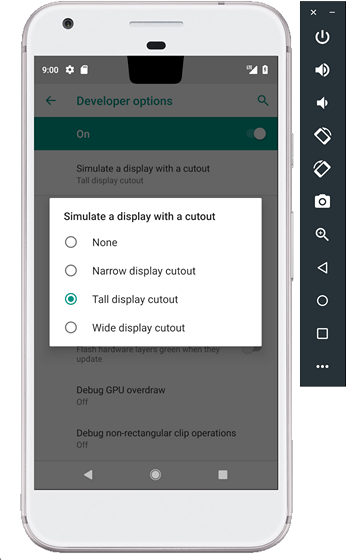 Of course this support is only for devs to incorporate cutouts while designing and developing apps for Android P.
The other visual changes, thankfully, are more original, and include rounded corners for the Quick Settings panel and notification shade. 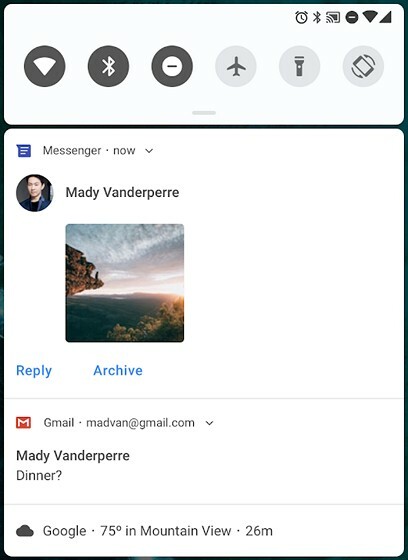 As part of the new ‘Smart Reply’ feature, notifications from some chat apps are likely to have a distinct ‘Messaging Style’ look in the final build, as indicated in the preview. 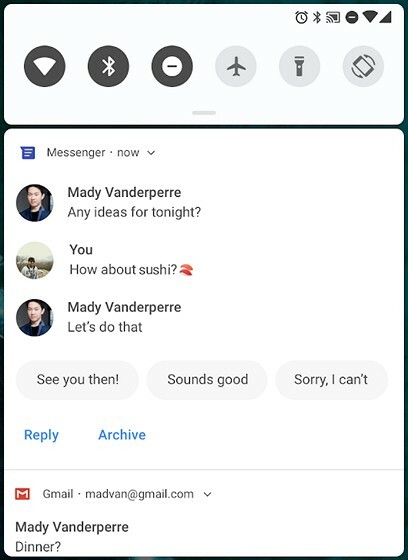 Those already using Android Messages should be familiar with this feature. Users will also be able to include images and stickers directly from within the notification, as seen in the image below. You’ll also henceforth get prompted with a standard accept/decline dialog box when an app requests for your fingerprint for ID purposes. Android P brings along a few functionality changes as well, and one of the biggest ones relate to security. Android P will not allow apps in the background to access the microphone, camera and SensorManager sensors. There’s also a multi-camera API that will allow apps to request data from more than one camera at once. Google is also promising better battery management with improved Doze, Standby and Background Limits. There’s also support for Wi-Fi RTT (Round-Trip-Time), better AutoFill, and improved performance for ART and Kotlin apps. Android P will eventually start shipping by the end of the year. However, Google is dropping support for three smartphones and tablets. Google confirmed to Ars Technica that the Nexus 5X, Nexus 6P and Pixel C won’t get official Android P support. Now, it may change its mind at a later stage or perhaps supporting them would become a viable choice, but at the moment, it’s no Android P for those devices. Either way, if you own any Google Pixel phone – first or second gen – you can download the Android P Developer Preview from the official website. Do note that the software is still in very early stages of development, so we won’t recommend it for your daily driver just yet, but just for testing or taking a look.